Last Fall my mom's group at my church organized a Saint-themed Peg doll swap. Everyone would make enough of one saint for everyone in the group, and then we'd get together and trade them so everyone would have a full set. I like painting, and saints, so I signed up..and so did 24 other people! I had been expecting to paint like 10 or 15! First I did some research and sketched out my design on paper. 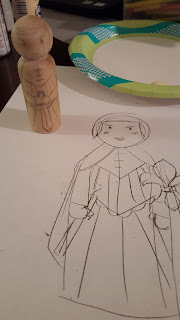 Then I sketched out my design onto a peg doll for reference and did batches of five dolls at a time in steps. 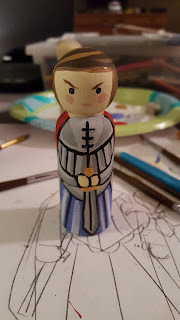 The first layer I painted was the skin, then I blocked out the other big under-colors, then added highlights in paint and metallic marker, and outlined it all with a black paint marker. After it was thoroughly dry, I stamped the back with tiny fleur de lis using a stamper I found on Etsy and finally signed the bottoms with sharpie and sealed it with a glossy sealant. I think they turned out great! 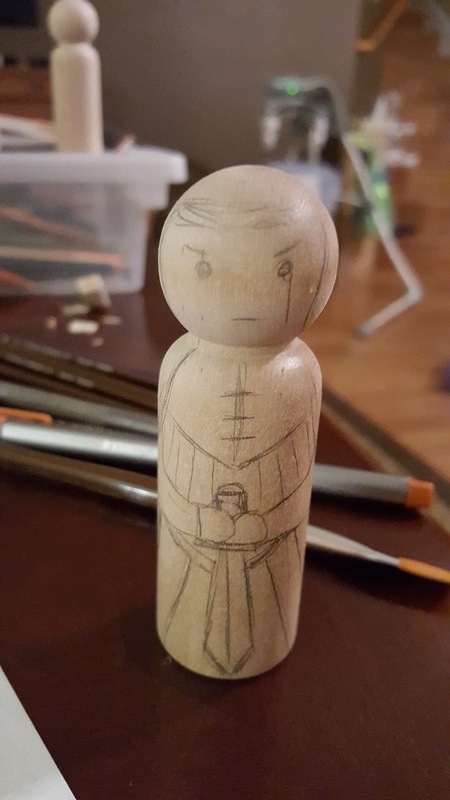 My mom said that Joan looked too mean, but I wanted a fearsome warrior look. But I think my favorite part is her little hair swirl. It's so cute! 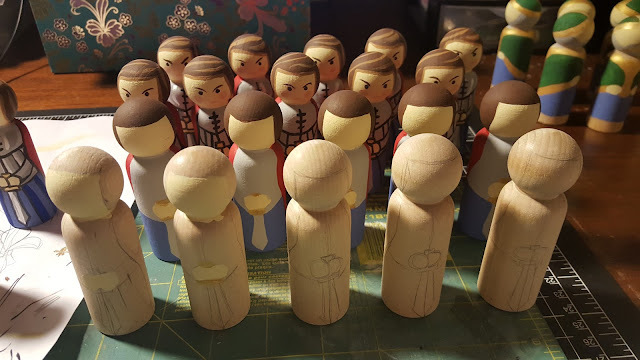 I finished my batch in plenty of time, and then set to work helping John and Diana with their St. Patrick peg dolls since in their 2-under-2 household they were strapped for time to work on this particular project. The design and stuff was all John's, I just helped finish them up!